Thread: Is this a perfect cage size for two lovebirds? I have two lovebirds, both couples. They currently live in a fairly large cage. However, they've had this cage for so long and it's so hard to clean! Poops everywhere, I'm telling you. So, I'm planning on getting a new cage. They're fairly active birds and spend their mornings in the cage and at night. Around the beginning of the afternoon is when they're released. They run around and have fun and sometimes come back to eat food/hang out. With all that information, does anything think this would be a good cage for them? 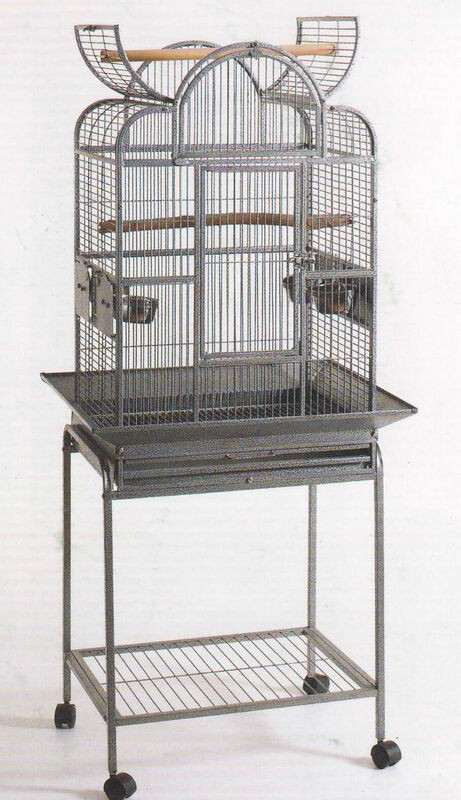 Elegant Wrought Iron Construction cage with Animal Safe Non Toxic powder coated finish safe for bird. Metal Around seed guards included. Slide-out grate and bottom metal tray for easy cleaning; Removable Stand With Four Swivel Casters for mobility and durability. Re: Is this a perfect cage size for two lovebirds? 22 by 17 for 4 birds? Doesn't seem very spacious to me.... How big is the current cage? Ah, sorry. I meant I have two lovebirds. It looks like a great cage for your two lovebids! They are going to love hanging out on top of it too. how to set up the perfect cockatiel cage? What is a good cage size for a pair of lovebirds?